Culver Lady Dawgs basketball team beats Chemawa Braves 43-36, Sheridan Spartans 64-25. The Culver Lady Dawgs basketball team looked back on track with their winning ways after defeating both Chemawa and Sheridan this week. The Lady Dogs were coming off a slump, with several players injured, either not playing or playing injured. Culver has been fighting through adversity and, even without as many players, are still in the hunt for a state playoff appearance. 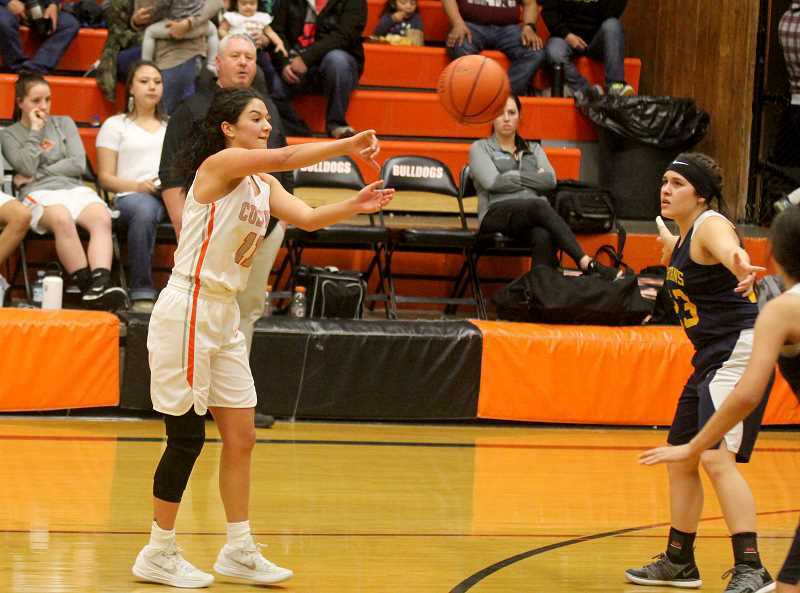 In the Sheridan game Jan. 24, the Lady Dawgs took an early 10-0 lead, 8 points coming from Irma Retano, who played in her second game after returning from a knee injury. Culver held the Spartans to 2 points in the first quarter, taking a 16-2 lead at the end of the first. 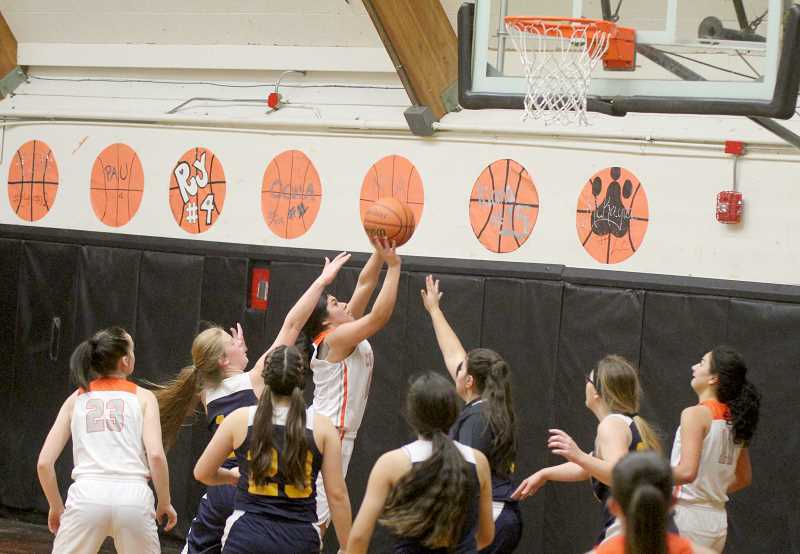 Retano's free throws, Mia Gamboa's 3-pointer, Kiana Webb's fast-break lay-in and back-to-back baskets by freshman Sierra Bautista gave the Lady Dawgs a commanding 28-2 lead. Gamboa finished the quarter with a hard drive to the basket and a fast-break score, giving Culver a 29-point lead at halftime. Sheridan only scored 3 points in the second quarter, all by free throws. The Lady Dawgs pulled back on their press, but still went on a scoring tear to start the second half. Retano hit back-to-back corner threes and Gamboa found a sprinting Nena Mendoza on a fast break. Sheridan called an early second half time out, down 42-7. Culver put in their second unit at the end of the third quarter and headed into the final quarter of play with a 39-point lead. The fourth quarter was led by Karmen Horat, who finished the quarter with 6 points. The Culver Lady Dawgs demolished the Sheridan Spartans 64-25. Retano led Culver with 26 points, 13 rebounds, nine steals and five assists. Gamboa was behind her with 11 points, seven steals, two rebounds and two assists. Horat and Bautista both finished the game with 6 points, with Webb and Haessler combining for nine assists. "We knew, especially when we lost Irma, we had some big shoes to fill," Gamboa said. "The players knew we had to make up 25 points and 15 rebounds a game. We really tried to fill those shoes and bounce back the best we could." "Now we know how other teams play, and they know how we play, but I think the team is going to be way more prepared for other teams than they are for us," she said about the second part of league play. "Last year, teams only played man defense on us, and this year, almost every team was in a zone. Now we know what they are going to do and we will prepare for that." "We can definitely finish in second place," said Gamboa. "Our goal is always to be first. Kennedy is in our league, but I still think it is attainable. We need to win the rest of our games." The Lady Dawgs also played Chemawa on Jan. 22 and beat the Braves 46-36. Culver only managed to score 5 points in the first quarter and found themselves down by 3 points early. They exploded for 18 points in the second quarter and were able to take a 23-21 lead at halftime. A mix between holding the Braves to 8 points and scoring 17 points in the third quarter helped Culver beat Chemawa 46-36. "We played well," said head coach Scott Fritz. "Back when we were dominating games, we had around 12 turnovers a game. In the Chemawa game, we still make little mistakes, having 22 turnovers. We have had a lot of different players in right now and our press was effective, but we would still give up some easy baskets." "Sierra Bautista had a great game," he said. "She played pretty much the entire second half and at one point Chemawa changed their defense to man and little Sierra (5-4) was playing the five position (post). She was the shortest player out there, but had a great game. I was really proud of her." "It was a workman's game," said Fritz. "It wasn't pretty, but they just steadily pulled ahead. It was great being back in our press. We haven't been able to do that for a while." "We have to beat Colton and Western Christian," Fritz said about making the postseason. "Santiam is going to be a really good game again. It will come down to who will be in foul trouble or who can get hot. We don't match up with Gervais very well and they run a very good zone, so we need to come up with something to beat that." As of Jan. 25, Kennedy was 10-0 in the Tri-River league with Gervais behind them, 7-2 in league. Culver and Santiam were both 5-4 in the Tri-River Conference and Western Christian was close behind with a 4-5 league record. The Lady Dawgs played Kennedy Jan. 28, after the Pioneer's deadline. They travel to Santiam on Wednesday, Jan. 30, and have a home game against Colton on Friday, Feb. 1.